Inspired by instructions from Rehmi Post and Kit Waal. 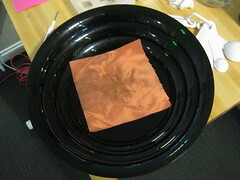 Insert piece of copper fabric. 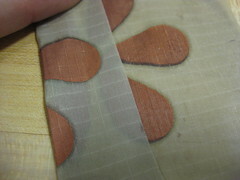 With resist applied to the areas taht you do not wish to etch away the copper from. See bellow list of resist media. 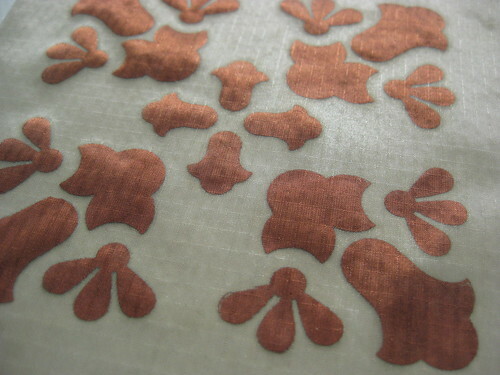 For copper fabric we have been using pure copper polyester tefta fabric sold by LessEMF. 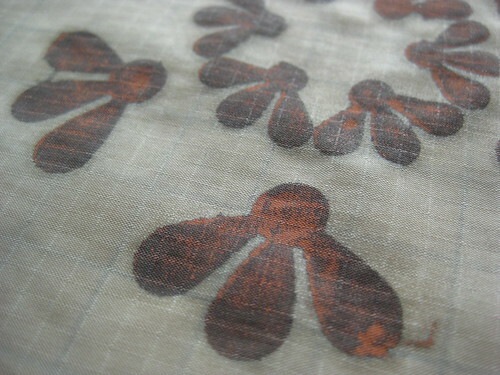 It takes up to 12 hours for the first piece of fabric to etch, but after that the following pieces take roughly 2 hours. 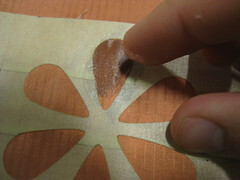 In the above examples the resisting medium (Vaseline) was only applied to one side of the fabric. 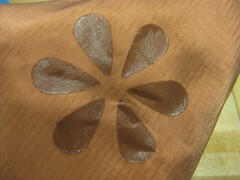 Even though the Vaseline penetrates the fabric it does not protect the reverse side from etching. As can be seen in the following image. 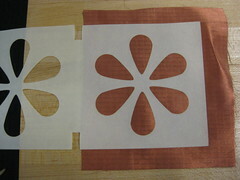 If you want to preserve more of the copper you can apply Vaseline (or another medium of resist) to both sides of the copper fabric. 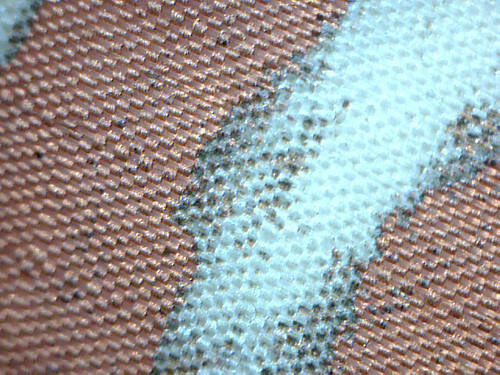 The following photos show an example of this. 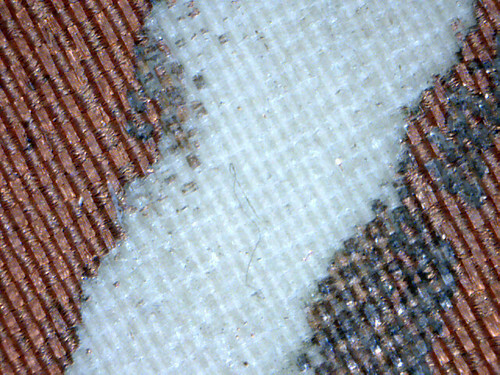 How effective is this technique on regular non-fabric PCBs? 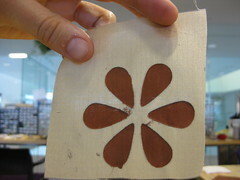 If so, Vaseline mixed with some dark powder could be painted on with a fine tip paintbrush. Can’t imagine why it won’t. (That’s speculation of course) I’ve been bugging myself to try Coke as an etchant. Might be safer than the stuff commonly used in pcb making, provided you don’t drink the used etchant, of course. Cola contains phosphoric acid or citric acid depending on where you live. Pure citric acid is actually easy to come by (look for it in asian stores, health food shops, brewing suppliers). 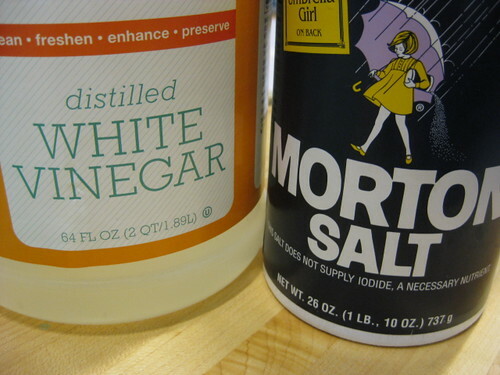 Like vinegar, it’s a weak acid – but I found it to dissolve egg shells faster than vinegar. That may have been down to the concentration though. I do wonder if it would work instead of vinegar for etching as vinegar typically comes pre-diluted whereas citric acid is typically sold as a white crystalline powder.